Do soldiers in combat really yell and scream like in movies? 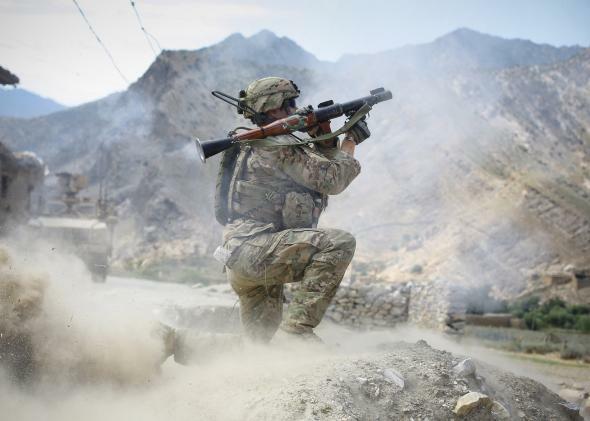 A soldier fires a rocket-propelled grenade during a firefight with insurgents on June 22, 2012, in the Pech Valley, Afghanistan. Of course we do. Firing a gun is loud. Firing repeatedly within a short timespan can cause hearing loss. With larger rounds, firing even a single shot might temporarily deafen you without ear protection. You have to make sure that people can hear you over the racket and clamor going on. Even within armored vehicles (that fire guns orders of magnitude louder than a rifle) it can be deafening, and most modern tankers wear headsets for communication like pilots do. Communication is a critical part of the infantryman’s arsenal. It’s important that everyone else in the fire team have situational awareness of what everyone else is doing at all times. If I’m firing, they may be relying on me to keep firing in order to move to different cover or a more advantageous position. So when I’m reloading, I need to shout “reloading.” When I bound up to my next position, I need to let everyone know I’m doing it so I don’t accidentally get shot and so they know to increase their suppressive fire while I’m a vulnerable target for the next three to five seconds. So I’ll shout “moving,” and when I reach my next position and get down and into firing position, I’m yelling “set” in order to let them know that I’m ready to cover the next person’s movement. Of course, we’re yelling distance and direction (“Contact!” “Dimounts, 2 o’clock, 150 meters!”). Infantry don’t usually just roll over an enemy frontally. We typically conduct what’s called a “bold flanking maneuver,” in which part of the element (in a squad engagement, typically one fire team) provides a supporting base of fire, while the other part kicks out to the side anywhere from 50 to 150 meters (or more if necessary) before moving forward and wheeling about to flank the enemy from the side and assault through the objective. When this happens, the two elements will probably need to shout at each other as well as use other forms of communication. In my squad, in addition to us having radios, we also carried whistles and VS-17 panels (think a foldable version of an bright orange highway sign) if we couldn’t be heard shouting or if our radios had malfunctions. We need to know the status of the flanking element so we can give the order to “shift” or “lift fire” when needed so we don’t catch our other element in a crossfire when they’re bounding across the objective. We need to let people know when grenades are being thrown (“Frag out!”) or coming in (“Incoming! Splash in five seconds!”). Tankers have their own lexicon. They’re constantly shouting things throughout their track—telling the gunner to “load sabot/heat” based on the type of target, telling the driver which way to orient to present his frontal armor to the enemy or the gunner which way to look, or to announce that rounds are being fired on target. For close quarters combat, 99 percent of the time, stealth is out of the question, especially in an urban environment. I’ve done a few patrols or operations where we quietly and stealthily inserted into an area of operations, and of course when you’re not yet in contact you are maintaining noise discipline. And you may, for tactical purposes, temporarily shut up (for instance, if there’s a known enemy behind a door you’re about to breach). But once the enemy knows you’re there, it’s much more important to communicate. For an easy example of why this is necessary, go to any gun range, and stand about 5 feet behind the firing line. Take off your ear protection and try to have a conversation with a friend standing next to you. Let me know how that goes. Combat: How should one use an assault rifle most effectively in house-to-house urban combat? Military Personnel: What sets special operations soldiers apart from regular soldiers in the military? Military History and Wars: What are the most mind-blowing tricks used during any war?